Hero Dog of Socialism's Triumphant Journey into Orbit, Sending Signals to Tinfoil Hats Worldwide for the Eventual Complete Collapse of Capitalism and the Glorious Victory of Strong Communism! Laika, I love you. I even have a Laika stuffed dog. Whatever happened to your experimental lovechild with Lennin's brain? Carlos the Jackal seemed like such a stron player. The best of spacedog, and revolutionary. Happy anniversary Laika Space Dog! I am glad to see that the reports of your demise (obviously an Imperialist Bush/Cheney/Rove lie) have been greatly exaggerated. Make sure Kenneth continues to adjust the frequency so that you may continue to broadcast Pravda to the moonbats Party faithful for many years to come. We never made the 50th Anniversary Laika T-Shirts! Heads will roll! Oh well... all we have to do is wait another 50 years. Just like with the advance of Communism in the Motherland. Still, we could celebrate with hamburgers, and, um, well, hot dogs. 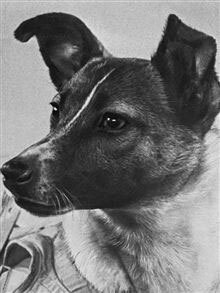 Congratulations Laika on your glorious 50th anniversary!! That is a true milestone that will never be duplicated. I don't suppose you have a count of the number of orbits you have made now spreading the glorious message? Dogs everywhere look up to you! Actually, I suppose in a sense, even the poor bi-pedals and finned comrades do as well. Laika was a true hero, and a most fortunate one to have survived to be with us today. When I was in grad school I was an assistant to a brilliant man who was into physiological psychology. Many of the professors there had worked for NASA and he was one. One of my chores once was to help clean out one of those electrically shielded labs where they had stored old journals and papers etc. I was really enthralled reading through some of the articles and studies he had there that were about the very real dangers they speculated about prior to man being sent into space. There was many an expert that opined that there was no way a man could survive space flight for many reasons, from the weightlessness, cosmic rays, you name it. Of course reading this post man on the moon, it seemed rather silly, but these articles were from a mere 10 or so years prior to the moon shot, and there were very real concerns. It was fascinating to see these articles to say the least. The professor I studied under helped to design the face shields and instrument layouts for the Apollo program. Loved him to death! He was German, but spoke better English than most, and you could always tell in class when there was something you best pay attention to for his eyebrow would rise and he would grin and twist his mustache. Although I am a proud progressive Amerikan, I have to admit that our space program was successful because more German rocket scientists thought it nicer in Alabama than in Vladivostok. Vladivostok....Alabama.... seems like a tough choice to me. I really do find von Braun's decision incomprehensible. After all, that horrible Truman compared to Uncle Joseph? Simply unthinkable! The only thing I can figure is that Bush waterboarded von Braun till he simply gave up his desire to go serve Uncle Iosef. Laika's Annual May Day Address: Вперед! Vorwärts! Forward!